One of my favorite things to do once the good weather shows up is head outside to the garden. It always starts with my perennial garden. If you love being in the garden then you know how exciting it is when everything starts to come through the ground. With it being our first year in our new home, We have a lot to figure out with our lawn, well "lawn". I say it with quotations because the only lawn we have is directly in front of our house, and the rest of it is mostly crabgrass. 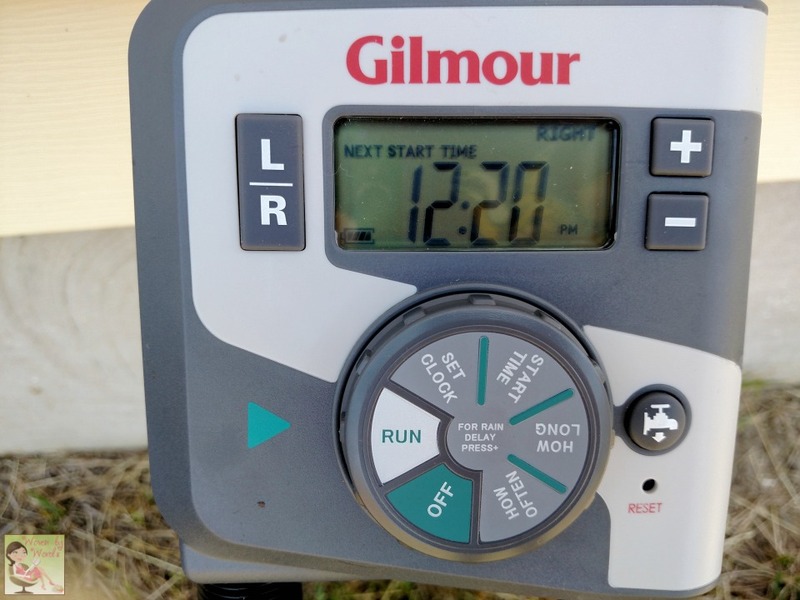 I reached out to Gilmour because when I worked at Menards, we had so many of their products in my hardware gardening section! I love working with products I'm not only familiar with, but believe in. It doesn't matter if you're a city dweller or from the country, when people came into my store, they knew what they wanted, and sakes alive if we weren't constantly down stocking because our stock always ran out! When they agreed to work with me on a review & giveaway, I was over the moon! We don't have any great access to the backyard to water it. The lawn and my vegetable garden both need a hose that can go over a fence and not bend in such a way that the water flow is cut off. Thankfully the Flexogen hose does that job well! It has flexibility and is kink resistant. Exactly what we need. I also wanted hanging plants along the front of our house, but the quandary in that was watering them. 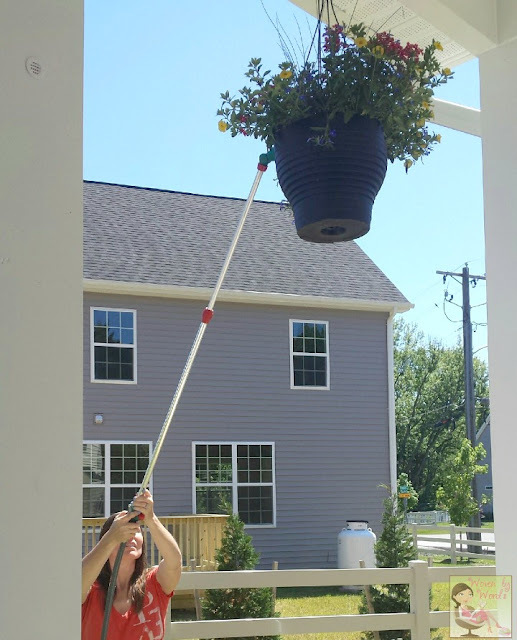 I'd either have had to take the plants down every time, brought the hose up on the porch, or tried to spray them from the yard. None of those were great options for me. Then along comes the 8 Pattern Front Control Watering Wand! THAT was fabulous! The watering wands were always what we in-store used for our garden center at work. They made watering the plants so much easier! Same thing for at home. Of course you've seen my flower garden at the front of my house, and I have high hopes for what that will become as time goes by. This garden I like to water by hand. It's my opportunity to keep an eye on the weeds, and see if there are any pests I need to worry about. I was so glad to receive the thumb control nozzle because my hands sometimes get tired holding in the trigger of one. This, you simply push it up or back with your thumb! Now the treat of all the items that were sent to me was the Heavy Duty Elevated Sprinkler. When I turned it on the first time, I was fascinated watching it. When they say it's a "gentle rain" that's exactly what they mean. I've actually considered pulling it up from the spot in the garden on a hot day, and just laying under it. I tried videotaping it with my phone, but all it catches is the center piece spinning. It doesn't capture the "rain" from it very well. I took the above picture before the garden on the left was planted. Now the sprinkler sits between both boxes, and showers them gently every morning with the dual timer I have set up. That couldn't have come at a better time! 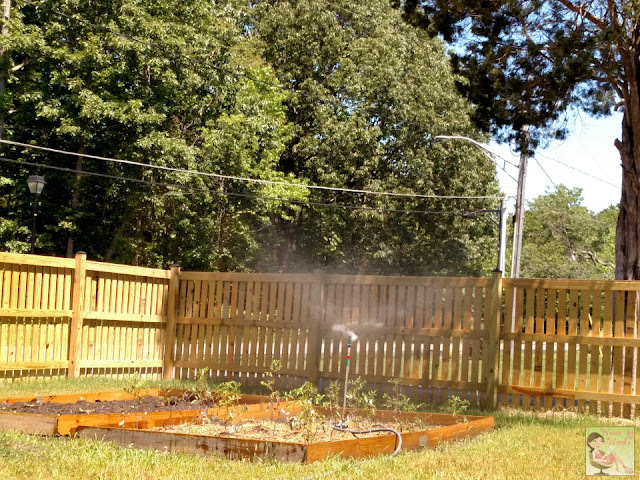 I didn't want to have to rely on Fred to water the grass and my vegetable garden while I was gone because he had so much other stuff on his plate. All I had to do was set the timer for the right and left, and off we went! 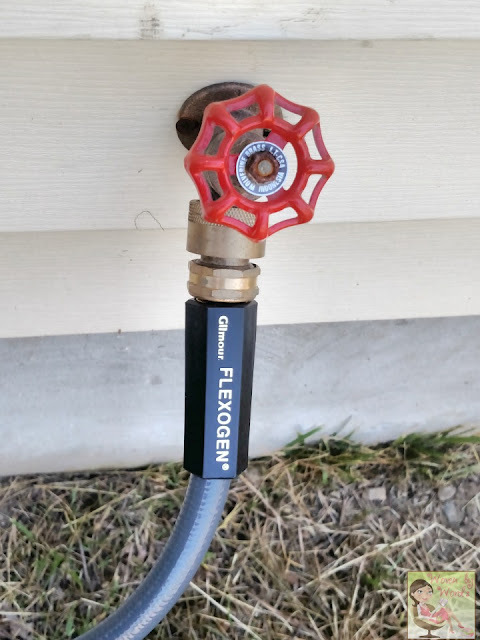 Fred did call me and told me he set it up so that the hoses would run at different times because we have low water pressure. Running them at the same time wasn't putting out much water. I'm glad he was paying attention enough to know that. Setting it up was incredibly easy. Following the steps on the dial is pretty much it. The only issue I had was pulling the battery door out the first time. It was a little hard to squeeze, but after the first time, I haven't had any issues. I'll be interested to know how the battery life is after running every morning for 3 weeks! 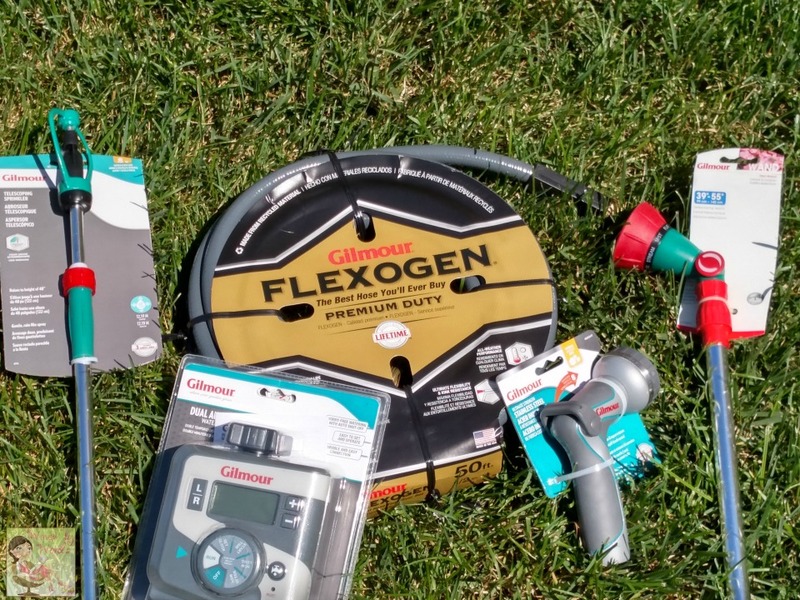 I'm glad to know that when we go on vacation in August and then to Peru for the mission trip in October, I can set this up, and no one will have to worry about watering for me! Now, let's talk about the Gilmour website. I don't typically talk about websites when I'm doing a product review, but their site isn't just any site. And no, they didn't ask me to write about this. I'm just so impressed with it, I couldn't NOT write about it. If you need inspiration, guidance, and education on all things gardening or outdoor at home, their site is where you should start! 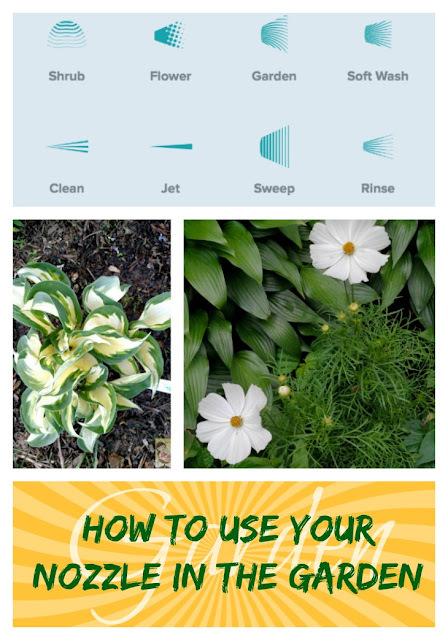 Yes, they do tell you which of their products to use in different settings around your yard, but they also help you learn about your yard and garden. One of the most helpful tools I think they have there is the lawn size calculator. Not sure how much hose you might need? It will help you figure that all out! I could totally spend days on their site learning and learning. I must warn you, once you get started going through their tips and techniques, you'll have a hard time stopping! Now for the fun part! The giveaway!! I'm giving away a hose and a thumb nozzle! Get ready to go Into the Garden. I think it was definitely time for you to get a new hose...LOL! The new one looks great and I love the time! I would love to use their flat soaker hose in my raised beds. Sometimes I don't get outside to water the plants, and they suffer! I need a new rotating water sprinkler. 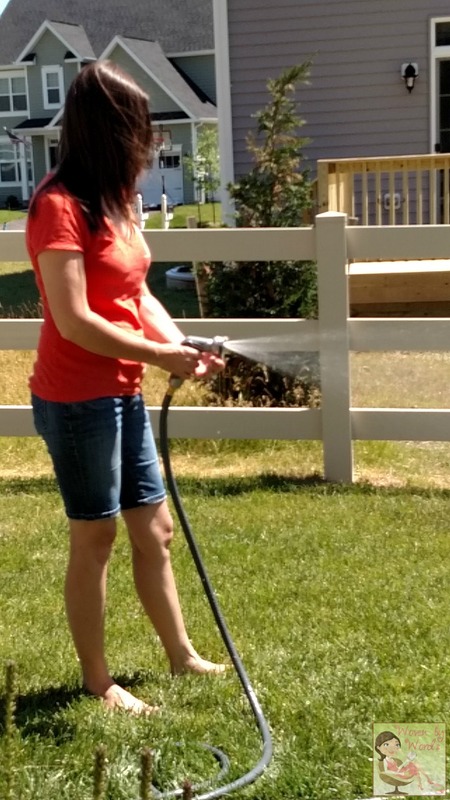 I like there very fancy sprinklers for my yard, and I think this hose and nozzle is amazing! I would love to win it for my yard! I would love to have the loppers. I have a lot of side stuff that grows over my fence from the woods. These would be great for cutting it back. The Lawn Sprinklers look nice! All of the products are cool :) Thank you! I would love the Super Duty EZ Click Control Watering Nozzle. 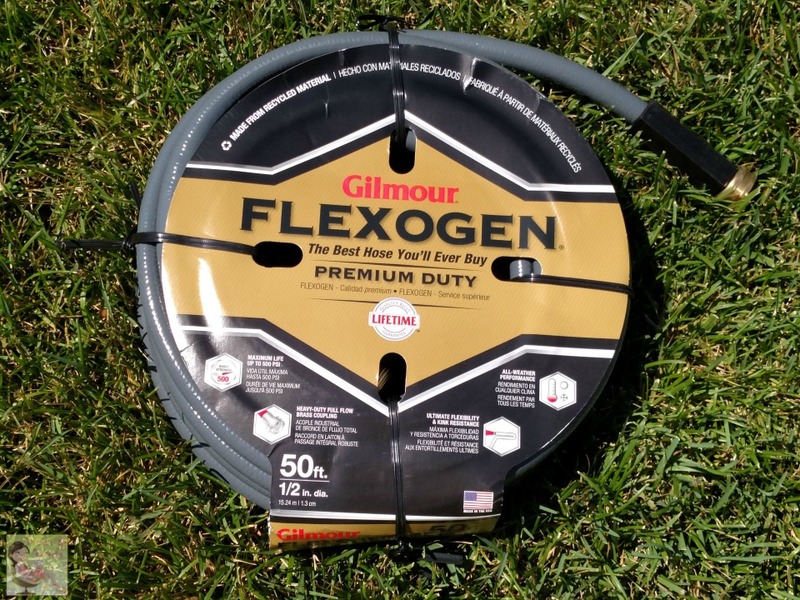 I love the Flexogen® Pro Hose. I would love the Commercial Bypass Pruner. Accidentally posted wrong Twitter sn, real name is @Larescoe. I'd like to have their Telescoping Bypass Lopper. Thanks. I’d also like to own their gear-driven tree pruner. I have so many pine limbs, that I can’t reach, that need to be pruned. This actually looks light enough that I could handle using it. 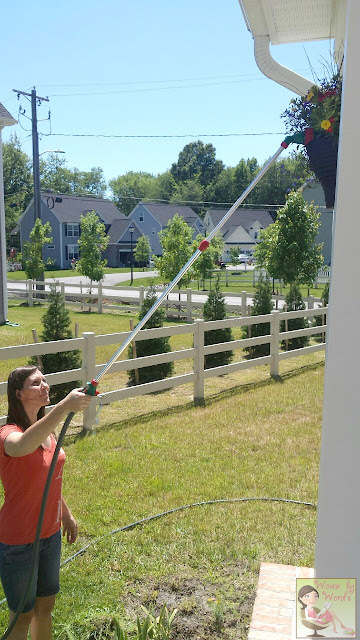 I would love to have the power jet wand, it would be so useful right now as I am cleaning both our front and back porches. I would like a Heavy Duty Elevated Sprinkler because we don't have sprinklers in our yard, and it is very large to water by hand. Wow, this is something I need for my garden and yard. 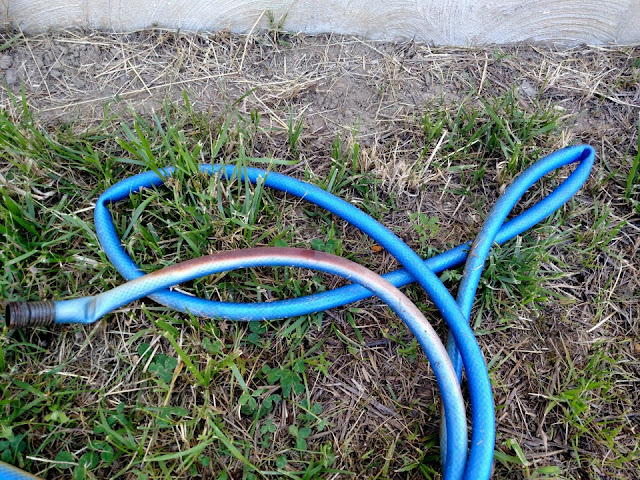 I love the hose, it's strong and looks like it will hold up well. I could use the Medium Duty Adjustable Circular Swivel Sprinkler to help with watering my gardens. I like the looks of their Trim EZ Bypass Pruner. We have a couple thousand feet of flower gardens and pruning can be very hard on my hands. These look lightweight and effective. I would love one of their medium rectangular sprinklers.